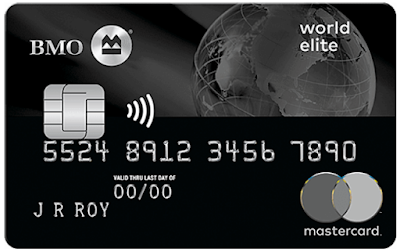 Up until recently the welcome offer for the BMO World Elite Mastercard was already quite rich. When it came out on October 2nd, the offer provided 35,000 welcome BMO Rewards points along with the waiving of the first year annual fee. Now the ante has been upped even more. Taking a hint from some competitors that are trying to eat away at BMO's market the bank is not holding back. They came out with an incredible promotion by not only offering the same welcome bonus and the first year free but now they're throwing in a $100 bonus when you charge $100 of travel related purchases on your card within the first six months of having it. All combined this welcome bonus along with the airline lounge benefit provide up to $640 in value! Limited time offer: Get a $100 bonus when you spend $100 on travel related purchases in your first 6 months ($100 value). That is a pretty rich offering. Remember you must spend $3,000 in the first three months to get the sign welcome bonus which broken down month by month of $1,000, isn't too bad. Then to get your $100 bonus for a travel related purchase all you have to do is complete a $100 travel related purchase in the first six months. That isn't very hard considering that if you make a travel purchase via BMO Rewards and incur a cash component you can use it towards that. For example, in month four of having the card you've already made your $3,000 in spending and have been awarded the 35,000 points. You book a flight between Vancouver and Toronto for $450 via BMO Rewards. You use your points, say 40,000 of them since you have been spending on the card for $285 credit toward that flight. You then use your card to pay for the $165 difference and voila you hit the $100 travel related purchase requirement. You are out of pocket cost for the flight is $65. Remember as well, this flight you bought was the flight you wanted, on the day you want, on the routing you want etc. Not what is determined by availability as found in other legacy reward programs. You can then use your lounge passes to access business class lounges when you take these flights! Another way is to pay for a hotel room on your card. Maybe you had enough points to cover the entire flight, well you might need a hotel in Toronto, simply pay for it on the BMO World Elite Mastercard as long as it totals $100 or more and you'll get the bonus credited to your statement. There are so many options here to utilize this $100 travel credit. This post was sponsored by BMO. The views and opinions expressed in this post however, are purely those of Rewards Canada.